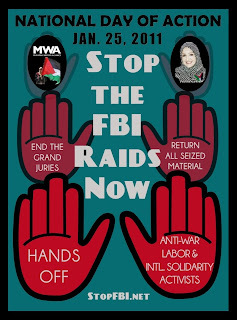 Muslimah Writers Alliance (MWA) and thousands of coalition members from 47 national and international cities are participating in the call for a National Day of Action to Stop FBI repression and grand jury witch hunts on Tuesday, Jan. 25, 2011. PRLog (Press Release) – Jan 24, 2011 – WASHINGTON, D.C. - In December 2010, under the direction of U.S. Attorney Patrick Fitzgerald, the FBI delivered nine new subpoenas in Chicago to anti-war and Palestine solidarity activists. Patrick Fitzgerald’s office is ordering the nine to appear at a Grand Jury in Chicago on Jan. 25, 2011. 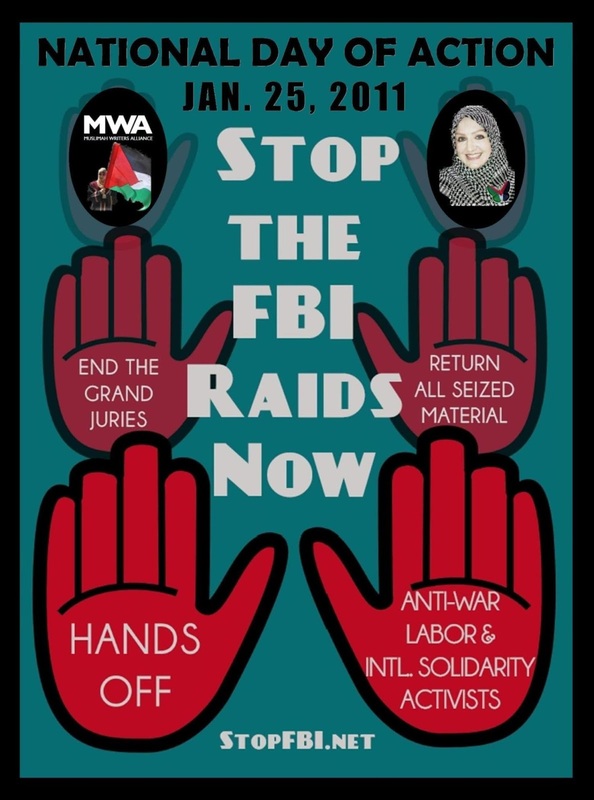 Accordingly, Muslimah Writers Alliance (MWA) continues its support of national and international coalition members against FBI Repression of Anti-War Activists and Harassment of Anti-War and International Solidarity Activists by joining in the call for protests on Jan. 25. Hundreds of organizations and thousands of people will be protesting at Federal Buildings, FBI offices, and other appropriate places, showing solidarity with the nine newly subpoenaed activists and with all the activists whose homes were raided by the FBI. U.S. Attorney Fitzgerald’s expanding web of repression already includes the 14 subpoenaed when the FBI stormed into homes on September 24th, carting away phones, computers, notebooks, diaries and children’s artwork. In October, all fourteen activists from Chicago, Minneapolis, and Michigan decided to not participate in the secret proceedings of Fitzgerald’s Grand Jury. Each signed a letter invoking their Fifth Amendment rights. However, three women from Minneapolis - Tracy Molm, Anh Pham and Sarah Martin - are facing re-activated subpoenas. They are standing strong and we are asking you to stand with them – and with the newly subpoenaed nine activists – by protesting Patrick Fitzgerald and his use of the Grand Jury and FBI to repress anti-war and international solidarity activists. The subpoenaed activists said in a statement, "Those of us subpoenaed in December were ordered to appear before the grand jury on January 25th. This is the same grand jury that was impaneled by US Attorney Patrick Fitzgerald in order to indict people from among those whose homes and offices were raided in September. We have made our decisions to stand strong with the other 14 subpoenaed activists from Illinois, Minneapolis and Michigan. We WILL NOT take part in this fishing expedition. " Maureen Murphy, who was summoned to appear before the grand jury on January 25 added, "Despite this attempt to criminalize solidarity with the Palestinian people, we will continue to stand with them and work to end US aid to Israel. Those of us facing the grand jury and the movement as a whole will continue to build the boycott, divestment and sanctions movement against Israeli apartheid and strengthen relationships between Palestinians living under occupation and their supporters here in the US." At the time of this release 49 events had been organized in 47 national and international cities, including: Albany, NY; Ann Arbor, MI; Asheville, NC; Atlanta, GA; Boston, MA; Brunswick, Victoria; Melbourne, Australia; Chicago, IL; Cleveland, OH; Colorado Springs, CO; Columbus, OH; Dallas TX; Detroit, MI; Dublin, Ireland; Duluth, MN; Fresno, CA; Gainesville, FL; Hartford, CT; Hilton Head, SC; Houston, TX; Kalamazoo, MI; Kiev, Ukraine; Long Beach, CA; Los Angeles, CA; Louisville, KY; Memphis, TN; Milwaukee, WI; Minneapolis, MN; New Haven, CT; Philadelphia, PA; Portland, OR; Providence, RI; Provo, UT; Raleigh, NC; Rochester, NY; Sacrament, CA; Salt Lake City, UT; San Francisco, CA; San Jose, CA; Seattle, WA; Springfield, MA; St. Louis, MO; Syracuse, NY; Tallahassee, FL; Tucson, AZ; Tuscaloosa, AL; Vancouver, Vancouver; and Washington, District Of Columbia. For event details visit linked listing here. >>>Tell Patrick Fitzgerald to call off the Grand Jury! >>>Call the U.S. Attorney General Eric Holder at (202) 353-1555 or deliver a letter by email addressed to: AskDOJ@usdoj.gov. >>>Call Department of Justice Inspector General Glenn Fine at (202) 514-3435 or (800) 869-4499; or fax a letter to (202) 514-4001; or send an email to inspector.general@usdoj.gov. Stop FBI Repression's petition here. International Action Center (IAC) founded in 1992 by former U.S. Attorney General Ramsey ClarkIAC's petition here. A leaflet about January 25 protests (with fill-in-the-blank event detail section) is available here. National Press Contacts: Maureen Murphy [630-290-0678] and Tom Burke [773-844-3612].